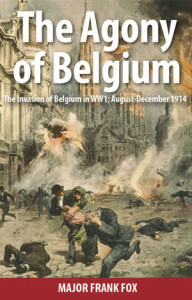 Below is the speech given by Dr.Charles Goodson-Wickes at both the Belgian Embassy in London and the reception at Kasteel Schoonhoven in Aarschot during the relaunch of The Agony of Belgium (The Invasion of Belgium; August-December 1914). The reception was hosted by Doctor and Mrs.Ludo Schellens at the Kasteel Schoonhoven in Belgium on September 10th, 2014. Indeed on 2 occasions during the invasion of Belgium his life was at serious risk as his poor linguistic ability led to his being taken prisoner as a German spy – in the North by Flemish young men and in the South by the French Cavalry. I hope that you will thus forgive me for speaking in English. May I say something about the genesis of this re-launch? It was the direct result of encouragement by 2 individuals during a visit to Belgium in February this year. The ﬁrst was Johnnie, Lord Astor, now a British Defence Minister. He and I – both of whom had served in the Household Cavalry, had discussed previously the generally poor appreciation of the remarkable achievements of the Belgian Army in WW1 in the most difﬁcult of circumstances. I mentioned that my Great Grandfather had been a War Correspondent attached to the Belgian Army and had written a contemporary account. I lent this book to him as the background to a speech he made to the Harvard Club dinner at Westerloo. 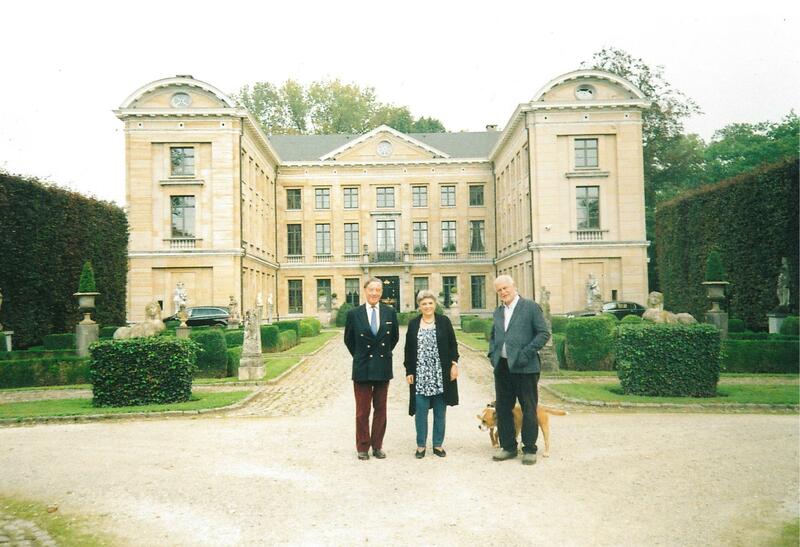 The other was Ludo Schellens when Johnnie Astor and I went to a splendid dinner here with him and Ria. He was fascinated to learn of the book, which I sent to him later. Both Johnnie and Ludo encouraged me to reprint the book, and both generously wrote recommendations which appear on the back cover. Not satisfied with that, Ludo and Ria offered this fine setting for the re- launch if I went ahead. lt is impossible to thank them adequately for their generosity and hospitality – am sure all of this very distinguished audience would like to express your appreciation. (Unfortunately Lord Astor is unable to attend as he has Ministerial duties in London). I will not bore you with the mechanics of arranging the printing and private publication of as book for the first time- an endeavour in which my elder son Edward gave major assistance. He works on the other side of the world and despite this gave expert input. The result is this limited edition which I hope you will acquire tonight. However it was a labour of love for me. Not many people have the privilege of knowing their Great Grandfather well. I was 15 years old when he died and he was my childhood hero. I respected and admired him – and you will learn from this book by him how much he respected and admired the Belgian people civilian and military and their brave King Albert. This resonates with Caeser’s description of the Belgae “as the bravest of the Gauls”. The book begins with a rather outdated romantic piece, but soon gets into a rare and vivid contemporary account of the activities of “our Army” in the daunting events in this country in the last few months of 1914. Throughout 2014, Europe and the World have rightly commemorated the start of WW1 a Century ago. There have been many expressions of reconciliation accompanied by ritual apologies. I am sure that we all ascribe to a policy of forgiveness – but it is quite a different matter to forget. Indeed it is a denial of history if we sweep uncomfortable issues under the carpet. 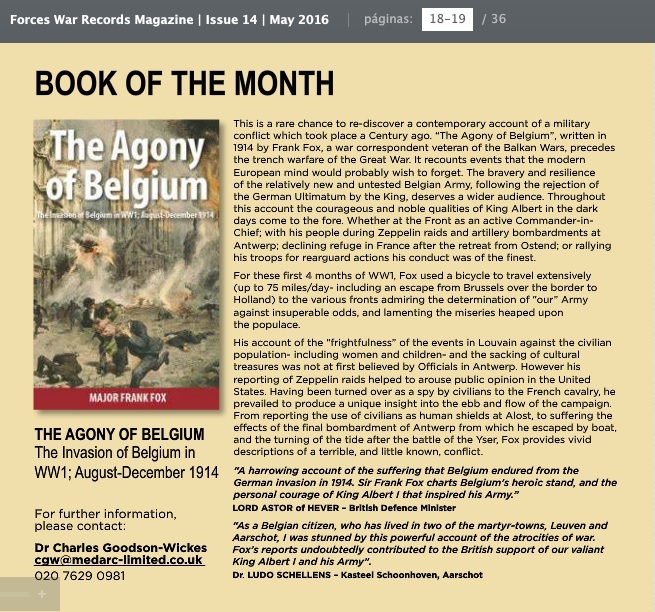 The title of the book (“The Agony of Belgium”) could not be more appropriate. It is reproduced without editing. I hope that it will contribute to a proud era of Belgian history. The text covers the German Invasion on August 4th, 1914 after King Albert’s noble and uncompromising rejection of the Ultimatum to a Neutral country and his Address to Parliament. After the fall of Liege, Fox extols the virtues of travelling by bicycle as he crisscrosses the country reporting on the skirmishes and battles as the young Belgian Army puts up a remarkable resistance against insuperable odds. A bicycle had the advantage of maneuverability and was less likely to attract the attention of a motor. The speed of his movements is breathtaking. He claims to be able to achieve 75 miles/day and there is no reason to challenge this. It is interesting to note that Belgian Carabineer Cyclists were often able to ambush the German Cavalry. On 16th August he bicycles from Brussels to Ternuzen in the Netherlands in 8 hours. Throughout the campaign his energy is extraordinary both on the various Fronts in order to get good observation points – and much further afield. Apart from this trip to the Netherlands he was constantly returning to Brussels and to Antwerp to liaise with the Government and General Staff. August 22nd ﬁnds him in Amsterdam- for no declared reason- and in September he was writing from Belgium appealing to London to send more British troops. After the fall of Antwerp he tells us that he went to London for 2 days, probably on a similar mission to inﬂuence his journalistic and political contacts before returning to the conﬂict. It seems that he witnessed all the major engagements during which the Belgian Army fought continuously from Liège to the Yser for 3 months to protect their own land, and to prevent a German advance to Paris; and to the Channel ports of Dunkirk and Calais, thus to threaten Great Britain. He went out of his way to get into harm’s way to record the actions. He often “unwittingly got ahead of a Belgian advance” and was reported as dead after cycling into the German Cavalry after the failure to retake Louvain on September 11th. Throughout the Campaign he condemns German “blind brutality” and praises Belgian “dignified fortitude”.